You might have seen portable vocal booths made out of a box with acoustic foam lining. Whoever used such a box knows that the audio recorded in it sounds boomy and boxy. 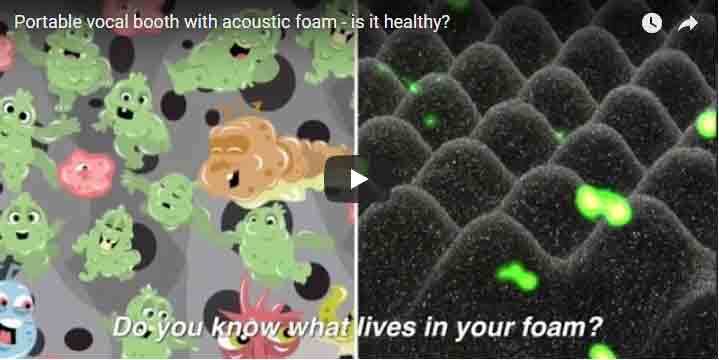 In this video we explore a different aspect of the acoustic foam: how healthy is it? We heard many complaints from people who had used a vocal booth or sound booth with acoustical foam as acoustic treatment inside. The complaint is that after some time the foam absorbs smells and starts to stink, especially if different people are using it. A director of communication technology in one of the US Universities told us that they had such a problem, when using a Mobile vocal booths for students, Especially it is a concern during a flu season. They tried to use Lysol to disinfect the foam, and deodorants to mask the smell, but after some time the chemicals start to disintegrate within the foam and the smell becomes even worse! What to do? Acoustical foam is widely used as means of sound absorption and acoustic room treatment. What makes acoustical foam absorb sound is an open cell structure, with long tunnels going through the foam. Sound gets into the openings and loses its energy in the long twisted channels. The acoustical foam has to have the open channels so the sound can get in. if you think of it – the foam is like a sponge. but what else gets into the open channels? what else gets absorbed by the foam? If the open cell acoustic foam behaves like a sponge, then it can also absorb and retain dust, mold spores, allergens, bacteria and viruses. What happens to the germs and allergens that landed on the foam? Mold spores, allergens or viruses trapped in the foam can potentially contaminate the next user when the foam gets disturbed. Because the acoustic foam is an open cell material with long channels it cannot be easily washed. If water gets in, it would stay in those channels and cannot fully evaporate. On the other hand, how can you wash the foam? In most cases it is glued to the wall, you can’t take it off, it is too fragile to be properly washed. How can you keep it clean and healthy? Some voice over actors told us that since they started using the Carry-on Vocal booth for book narration their publisher told them that it was the best sound they ever had! Carry-on Vocal booth is a great tool for travelling voice actor. It is light weight, durable, portable, easy to set up, versatile and can carry all your recording gear as well! if it gets dirty in travels – you can easily remove the Sound absorbing liner and wash it in a washing machine. Most importantly it allows you to record great sound anywhere! This entry was posted in Other videos, Portable Vocal Booth, Videos and tagged ACOUSTIC FOAM AND GERMS, KEEPING VOICE ACTORS HEALTHY, portable vocal booth. Q) How can I control traffic noise entering the patio section of my home I don’t want 100% sound proofing, but the best i can do to get the maximum gain?